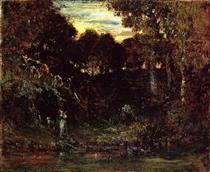 Étienne Pierre Théodore Rousseau (April 15, 1812 – December 22, 1867) was a French painter of the Barbizon school. He was born in Paris, France in a bourgeois family. 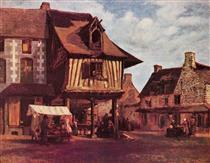 At first he received a basic level of training, but soon displayed aptitude for painting. Although his father regretted the decision at first, he became reconciled to his son forsaking business, and throughout the artist's career (for he survived his son) was a sympathizer with him in all his conflicts with the Paris Salon authorities. 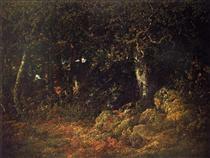 Théodore Rousseau shared the difficulties of the romantic painters of 1830, in securing for their pictures a place in the annual Paris exhibition. The influence of classically trained artists was against them, and not until 1848 was Rousseau presented adequately to the public. He had exhibited six works in the Salons of 1831, 1833, 1834 and 1835, but in 1836 his great work Paysage du Jura [La descente des vaches] was rejected by the Salon jury. He sent a total of eight further works to the Salon between 1836 and 1841; and yet none of them were accepted. Thereafter, he ceased sending work to the Salon until 1849, when all three of his submissions were accepted. He was not without champions in the press, and with the title of "le grand refusé" he became known through the writings of his friend Théophile Thoré, the critic who afterwards resided in England and wrote using the name Burger. 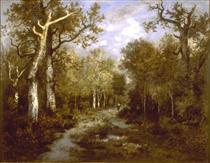 During these years of artistic exile Rousseau produced some of his best pictures: "The Chestnut Avenue", "The Marsh in the Landes" (now in the Louvre), "Hoar-Frost" (now in America); and in 1851, after the reorganization of the Salon in 1848, he exhibited his masterpiece, "The Edge of the Forest" (also in the Louvre), a picture similar in treatment to, but slightly varied in subject from, the composition called "A Glade in the Forest of Fontainebleau", in the Wallace Collection at Hertford House, London. 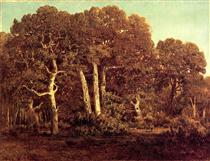 Until this period Rousseau had lived only occasionally at Barbizon, but in 1848 he took up his residence in the forest village, and spent most of his remaining days in the vicinity. He was now able to obtain fair sums for his pictures (but only about one-tenth of their value thirty years after his death), and the number of his admirers increased. He was still ignored by the authorities, for while Narcisse Virgilio Diaz was made Chevalier of the Legion of Honour in 1851, Rousseau was left undecorated at this time, but was nominated and awarded the Cross soon afterwards. He would eventually become an Officer of the Legion of Honor. At the Exposition Universelle of 1853, where all Rousseau's rejected pictures of the previous twenty years were gathered together, his works were acknowledged to form one of the best of the many splendid groups there exhibited. But, after an unsuccessful sale of his works by auction in 1861, he contemplated leaving Paris for Amsterdam or London, or even New York. Rousseau then suffered a series of misfortunes. His wife, who had been a source of constant anxiety for years, became almost hopelessly insane; his aged father became dependent on him for pecuniary assistance; his patrons were few. 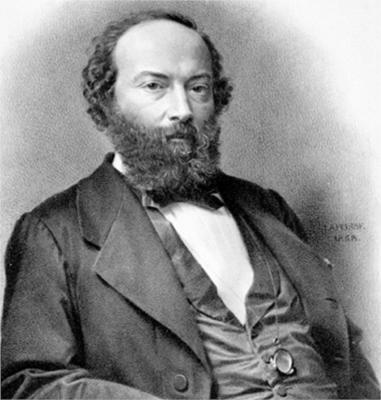 Moreoever, while he was temporarily absent with his invalid wife, a youth living in his home (a friend of his family) committed suicide in his Barbizon cottage; when he visited the Alps in 1863, making sketches of Mont Blanc, he became dangerously ill with inflammation of the lungs; and when he returned to Barbizon he suffered from insomnia and became gradually weakened. 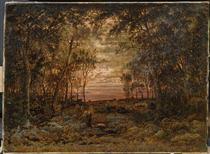 The campaign at sunrise Theodore Rousseau ? 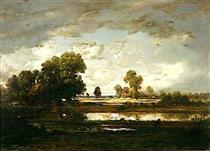 The plain of Barbizon Theodore Rousseau ?